It’s that time of year again: back to school for children and a little more freedom for the adults in their life! So, in the spirit of education and celebrating freedom from stress, we would like to teach you how to determine if your EHR software is cloud-based or not, and what benefits and freedoms you can boast when you use software that is in the cloud! The initial set-up of new software comes with stress purely from the adjustment of using something different than you’re used to. Why would you want to add the possibility of an installation gone wrong or hardware not functioning properly? With cloud computing in optical offices, there is no need to download anything: you just need a computer or tablet, and reliable Internet and you are good to go! Most systems have an application saved on your computer that you have to start up, and sometimes they take forever to restart since they are bogged down with so much information. Plus, with client-server software you have to have the software installed on each device you access your system from, leaving you and your staff very restricted. With cloud software you get any location, any device access with an Internet connection. So even if you're working from home, you'll be able to access your system by logging into a URL. Since your data is no longer in the office on your computer, you won't have to worry about securing and maintaining your data and software, it's all done for you by your cloud vendor. And cloud vendors know what's up when it comes to securing data, so security that they can provide on their servers and data is much more than you could likely provide on servers in your office. With conventional client-server systems, only one user can enter data at a time while saving important information. However, with a cloud-based system, everything is continuously updated, and multiple users can access and edit the same data at the same time. This means that two employees can be entering in patient information while another works on scheduling—talk about a productive workflow! With the software of the past, updates are always a huge deal. You usually have to set aside hours for down time and installations, they can be expensive, and they never come frequently enough to actually fix bugs, or to keep your software up to date with newer options. With cloud-based software, everything is updated by the vendor, and without interrupting your daily tasks and performance. 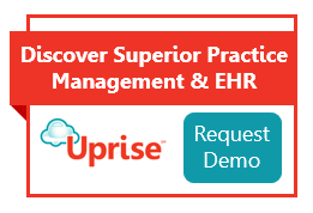 Want to see a cloud-based practice management and EHR in action? Check out Uprise!